Overshadowed by its near neighbour, the Earl's Palace, St Magnus Church is found in the village of Birsay, in the north west corner of West Mainland.The sign on the gate says that the church was established in 1064: so it comes as something of a surprise to find a church that at first sight looks as if it's only a small fraction of that age. 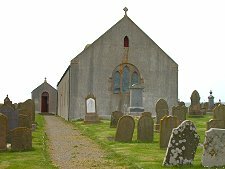 But appearances can be deceptive and historians agree that St Magnus Church does indeed stand at least partly on the site of the Christchurch built here by Earl Thorfinn in 1064: meaning that the site has been in continuous use as a church for nearly 950 years. 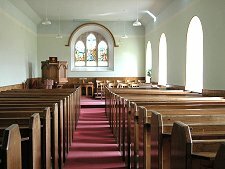 And even as late as 1873 it was recorded that the church was known by locals as The Christ's Kirk. On 11 April 1117 Earl Magnus was killed on Egilsay on the orders of his cousin and joint Earl of Orkney, Earl Håkon. 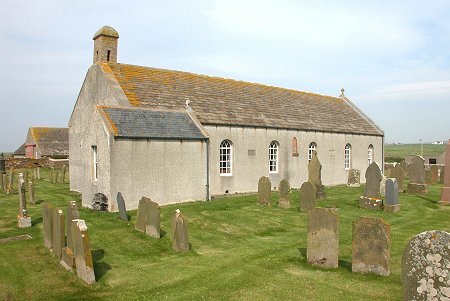 After his murder, Magnus's body was brought for burial to Christchurch at Birsay. 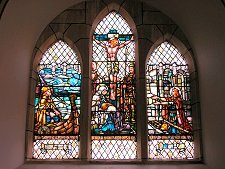 In 1137 his remains were transferred to St Magnus Cathedral in Kirkwall, newly built to celebrate Magnus's sainthood by his nephew Earl Rognvald. The Church was rebuilt in 1664 to a fairly ambitious cruciform design. In 1760 it was again rebuilt, this time as a simple rectangular church. This in turn was enlarged and restored in 1867; and further restoration took place in the 1980s. Superficially, today's church owes most to the 1867 enlargement. The interior is attractive in a plain sort of way. 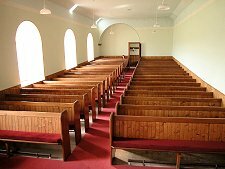 It is lit by a series of unadorned arched windows on the south side, plus a very attractive stained glass window in the east gable. This was designed by the minister's wife, Mrs Loveday McPherson and produced in 1904 by Alex Strachan. The inscription reads: To the glory of God and in proud memory of Magnus, Earl of Orkney. Gifted by members of this congregation and their friends, 1904. Less obvious are the features of earlier versions of the church that have been retained. The belfry that tops off the west gable dates back to the 1664 rebuild, while near the pulpit lies an old gravestone from 1645. Set in the exterior of the south wall is the filled-in surround of a lancet window dating back to the 1200s. 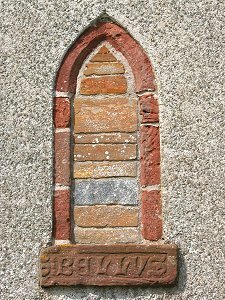 The lintel at the foot of this window carries the inscription "Bellus". This is probably a fragment of decorative stonework originally from Mons Bellus, the (now long gone) residence of the Bishops of Orkney built in Birsay in the 1500s at the same time as the nearby Earl's Palace. The outer walls of the church are covered in grey harling, covering up evidence of different dates and origins of various parts of the underlying stonework. However, the 1980s restoration revealed large blocks of red sandstone forming the foundations of the south east corner of the church, probably dating back to the original 1064 Christchurch.